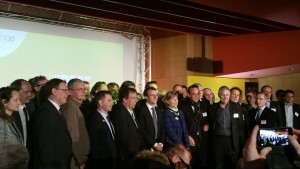 The minister of Economy asked BpiFrance to select 68 companies among the most powerful in France. The objective was to support them improving their growth in order to become ETI (a company with an intermediate size): This is the “SME’s (Small and Medium- sized companies) accelerator program”. Air Flow was selected to follow this program. “We selected the companies which are in growth, have ambition, are strategic but not tactical, which are able to surpass themselves” explains Nicolas Dufourcq, Public Bank CEO. Emmanuel Macron and Pierre Fiat – Air Flow’s head of development- talked about this topic during the introduction’s program. “I congratulate your company for its growth and dynamism” told Emmanuel Macron. “We are really proud to be chosen by BpiFrance” answered Pierre Fiat. “Our important investments, international development and our innovation program are very promising. We also have a proactive approach in order to find the best profiles and offer the best answer to the different challenges in industrial logistic and energy area”, he continued. – Turn key logistics solutions: Strategically located closed to large seaports, Air Flow exports industrial gases and Liquid Natural Gas worldwide in the respect of safety rules and the IMDG code. – Customized equipment rental solutions: As equipment availability and flexibility is a key factor both on the industrial and natural gas market. Air Flow proposes a large range of units and different rental terms that will be adapted to the customer’s project. Bpifrance brings companies together in order to see bigger and farther and to train champions of tomorrow. From the beginning to Stock Exchange listing, from credit to own fund – Bpifrance proffers in their customer’s area, financing solutions adapted to each company and for every step of its life.